Here’s the final state of the drawing. I just need to carefully scan over it to make a few touch ups. I’m a little further along on her face with more to go. I started using a gray Neocolor II oil pastel instead of just blending black and white, and that’s helped with the middle values. A white Craypas pastel is being used in the large white areas, but I found that I can also brighten that up more with a white PITT shellac marker. Several mediums in combination going on here. After this one’s done, I think I might make up my own oil pastel gray colors as I did with the black. That will help me avoid that bluish color shift. Not that I mind it here so much, but it’s not always desired. I think I’m starting to figure this new drawing out. I decided to use ink to tone the background, and went with cool gray Prismacolor layout markers to keep it as a drawn look instead of brushing on acrylic ink. I used a warm gray marker for her hair. This area I’m covering with a homemade block of black oil pastel. 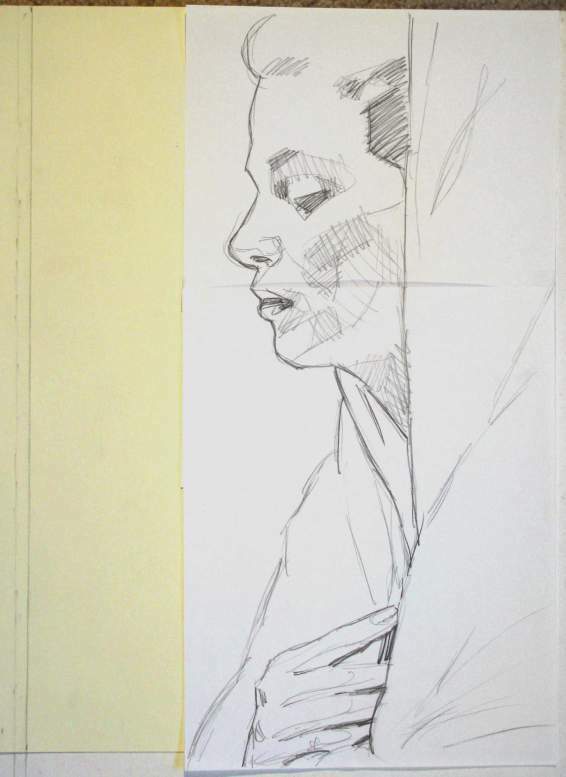 I’m also using a palette knife to smooth and scrape it down, and the wide tip of a carpenter’s pencil to get around the form of her profile. 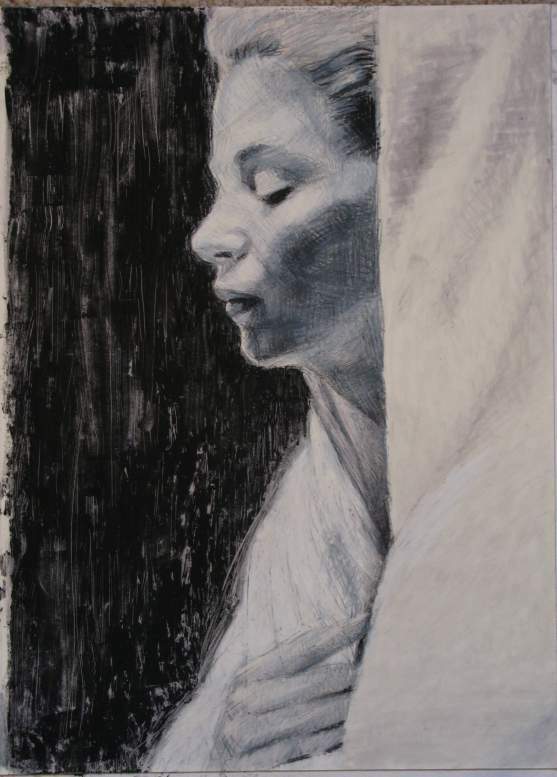 A Neocolor II black pastel also helps me get sharper lines. Well, that was the easy part. Let’s see if I can keep it going. I wanted to do some testing on the surface of the new drawing to see if my method was going to work the way I expected it to. I used a 2″ strip along the outer edge of the drawing as my work area. 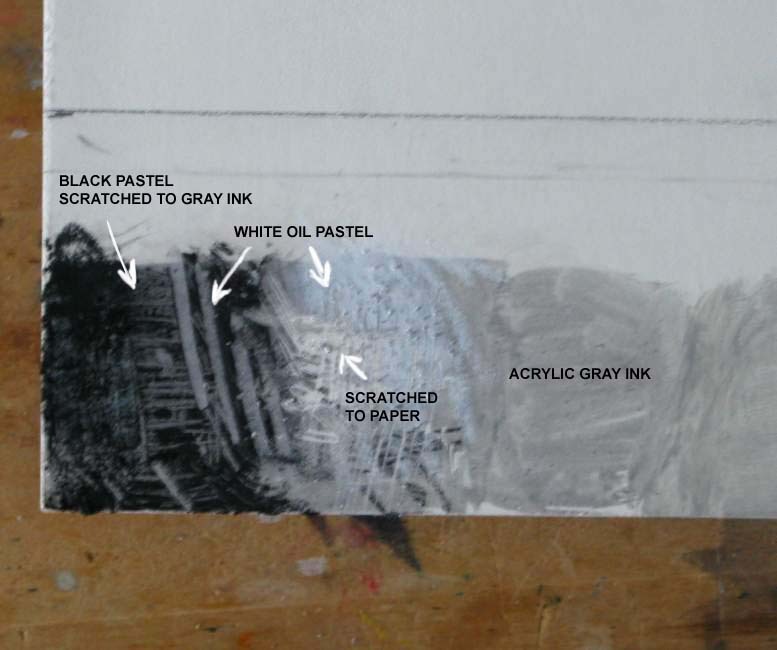 I quickly see that the tone of the paper is not dark enough for the white pastel to show up as intended, so I use some Liquitex acrylic ink, neutral gray #5, to make it darker. 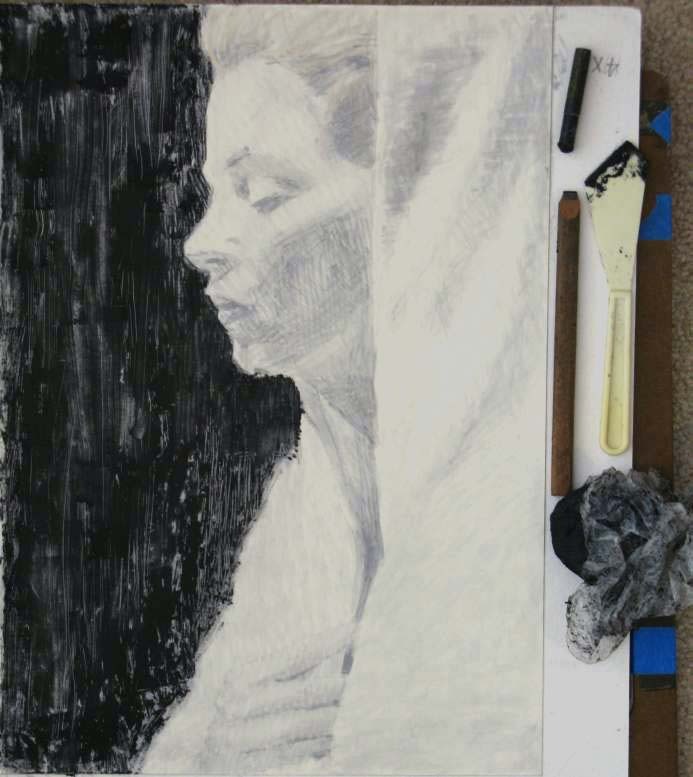 The black oil pastel I’m using is my own, made with charcoal. The white oil pastel only brings up the ink value slightly, and gives a bluish tone, which I still think I can use, but it’s not as bright as I’d like to go. Since the paper has been sprayed with a coat of shellac primer, I can scratch through the ink to the paper below, which is a shade brighter. The bluish tone could give me a nice penumbra transition between white and gray. 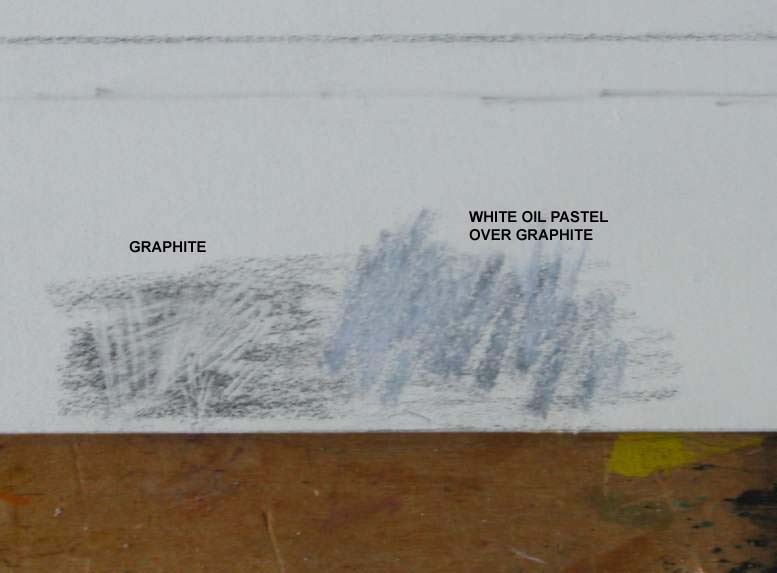 The next idea I had was to test using graphite as my gray undertone instead of ink. This would keep everything in a dry media texture. 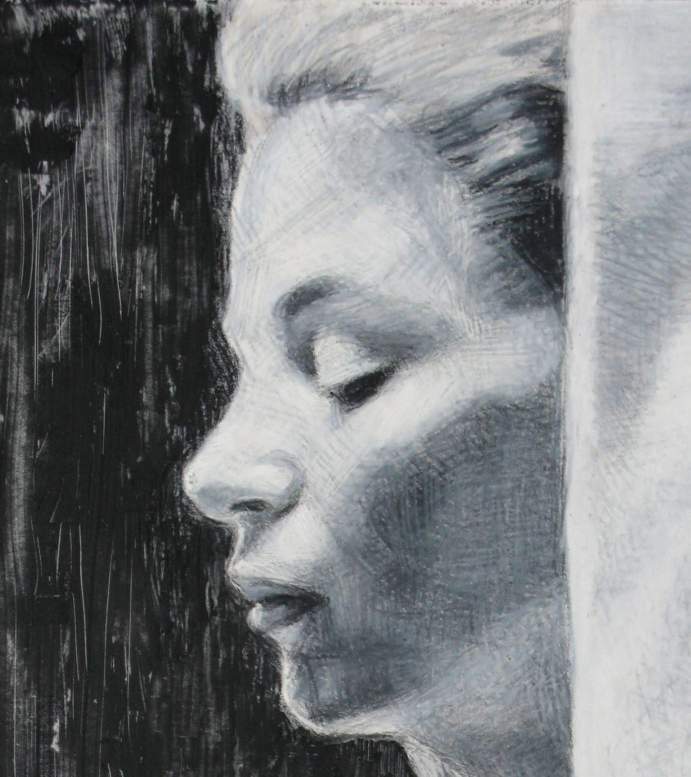 I was able to easily scratch through the graphite to the paper below, but when I drew across it with a white pastel, the pencil lines got darker. That is not an effect I want. I’ll have to sit on this for awhile to decide which way to go. I’m planning a new drawing. 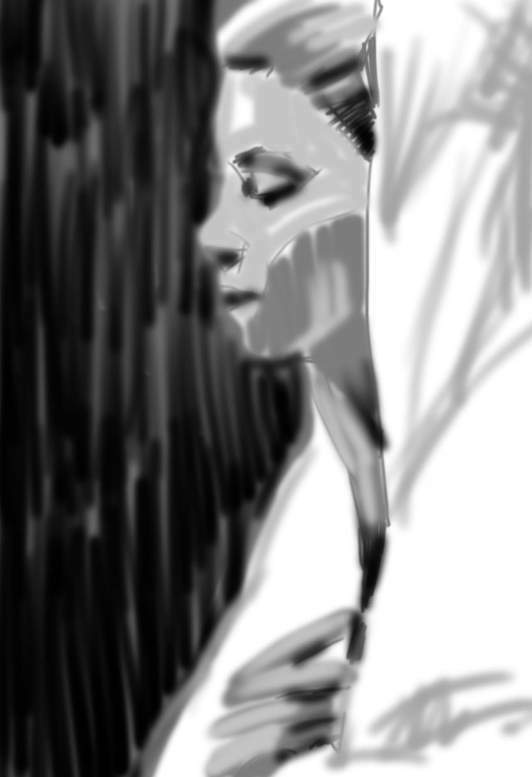 I first made a digital sketch of a face from my imagination, looking in profile. Next I decided what size the final drawing will be, 17 x 12″, and scaled that sketch on my monitor to trace it onto two sheets of scrap paper that I taped together. I also tighten up the drawing a little more. 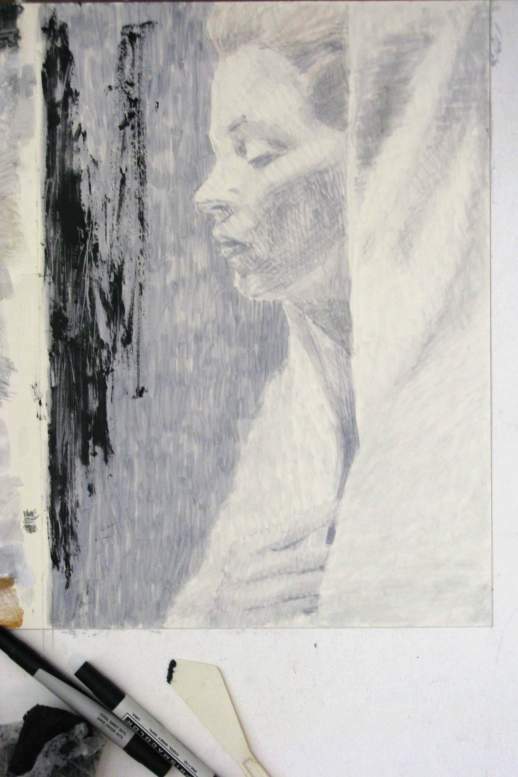 I’m thinking that this medium will be oil pastel, similar to a recent drawing I made all in black and white. I’m using a cream colored paper so I can also add white along with the black, instead of using the white of the paper. That should give me a little more depth, or so I hope. We’ll see how it goes. 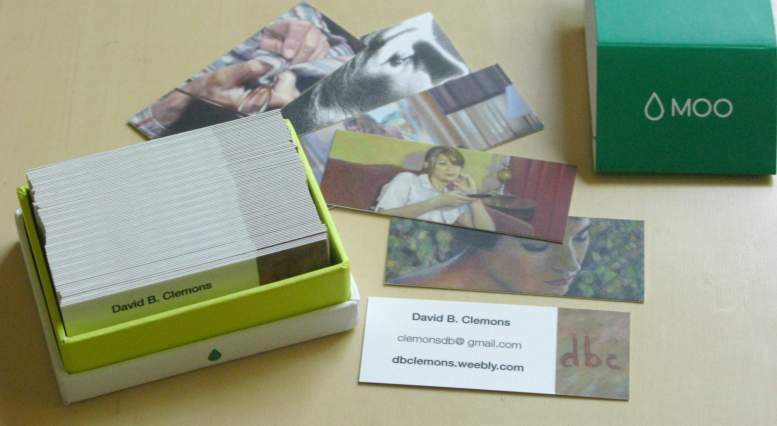 I ordered a new set of MOO business cards, and they arrived today. This small size is handy. A box of 100 cards cost $20. 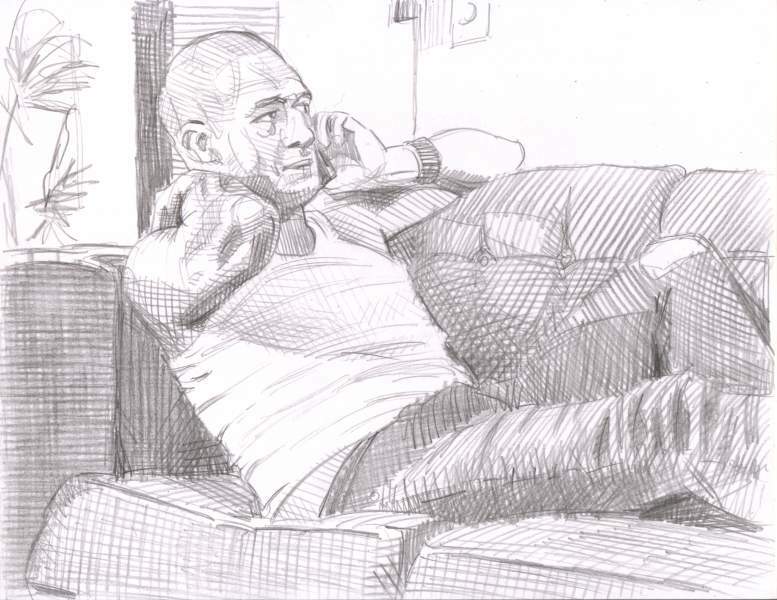 I visited with my friend Sergei recently, and he let me sketch him as he talked to his agent. He works as an actor and model. 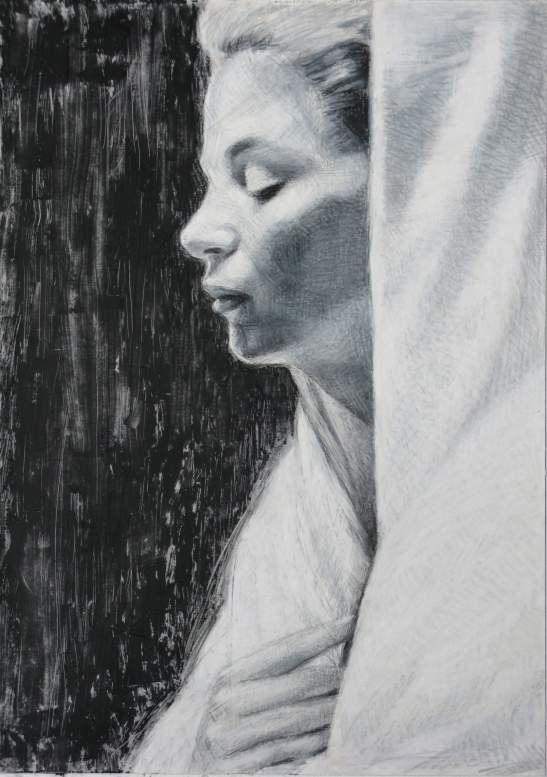 You are currently browsing the Artwork by D. B. Clemons blog archives for June, 2016.